Seven people were killed, including the gunman, and seven others injured on Friday night after a bloody drive-by shooting on the crowded streets of a small college town near Santa Barbara, as a man the police described as mentally disturbed methodically opened fire in a 10-minute spasm of terror. The gunman was found dead with a bullet wound to his head after his black BMW crashed into another car. He had exchanged gunfire with deputy sheriffs in Isla Vista, near the University of California, Santa Barbara. A family lawyer tentatively identified the gunman as Elliot Rodger, the 22-year-old son of a Hollywood director. Why didn't anybody stop him? ... As of February 2014, Santa Barbara County had 53 permits out of an adult population of 337,000 -- a rate of 0.016 percent. The rate was virtually unchanged from 2011. Nobody, not even the police, were able to stop him until he was ready to be stopped. Rejected by women, he posted several videos on YouTube (all since deleted by YouTube as unsuitable). The NYTIMES has posted a copy of the video, as did the LA Daily Times. And a southern news paper, and probably several other publications. His "day of retribution" speech, filmed in the drivers' seat in his Beemer, was smug and vitrolic. It was carefully staged. He was obviously quoting from a speech which he had pre-written and practiced over and over ... compulsively. Why couldn't he get a date? Pronounced sane, but still a killer? Wounded seven people at random, and in the process killed six other people. Whether he killed himself, or was killed by police in the second shoot-out, is not known now. It's time that people started out with the familiar question: "WHY?" The idea that police and psychiatrists can predict future actions is ludicrous. And in this case, nobody knew that he was capable of murder. I've been a devoted fan of "The Box O' Truth" for centuries, literally, so I was delighted to see that [H/T] Oleg Volk (in an article titled "The Perceived Inadequacy of M1 Carbine", had an actual link to a new episode which I had not yet seen. It hadn't a lot to do with the penetration of the 10mm, which I was most interested (boo to Oleg Volk for an article which ... most irreverently .. suggested that the Mighty Ten would not penetrate aluminum as easily would the lowly M1 Carbine poodle-shooter round), but it was interesting in that it (the box-o-truth entry) did address penetration in a general sense. You'll have to go follow the grout trail yourself to determine whether you found it as entertaining as I did. On the other hand .. who doesn't like "The Box 'o Truth"? Lethal + Lace ... oh my! After obtaining my concealed carry weapons permit, I was unable to find the right holster. I was frustrated at the lack of options for women. So I decided to make one. I wanted ONE holster that can be worn ANYWHERE on the body without having to buy more than one. Budgets are tight these days. They are EXTREMELY concealable, even in tighter clothing. 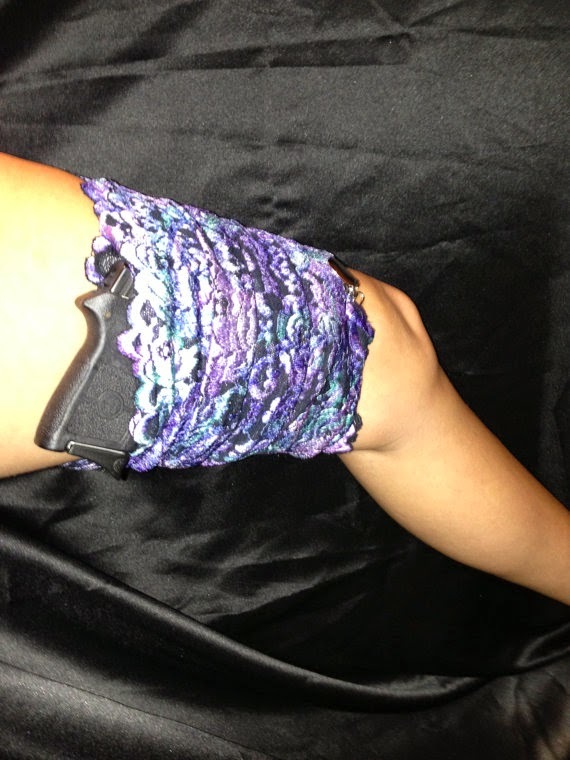 Visit www.lethallace.com for more information on how to wear this unique holster. It can by worn with any type of clothing. I have no idea how actually PRACTICAL this "holster" is ... but it certainly attracted my attention. Wonder where I can get one of these? Would it work under my t-shirt and blue-jeans? Another case for "Stick and Rock" Control? The attacker (a member of the local "Living-Under-A-Bridge" community) used unregulated, unlicensed weapons in a classic stick-and-rock attack. It was a horrendous attack. Something should be done. Why aren't Sticks and Rocks licensed in Oregon? It could have been worse. The attack might have taken place in a gravel parking lot or a forest, where multiple rounds are immediately available. Who knows how many lives might have been placed at risk when a single handful of gravel might contain more then ten rocks, and reloading is easy and immediate. And have you noticed how many sticks are immediately available in a forest? Remember, there is no law which requires universal background checks on purchases at stick-shows. Our hearts go out to the victim, Dennis Richard Becker, who was unjustly unceremoniously incarcerated for the simple need to make a living in a cruel world. At the tender age of 27 years, he was turned out of his family home by an uncaring, unfeeling father who refused Dennis's unspoken (or at least incoherent) cry for help. "No Guns Here; Please Rob Me!" 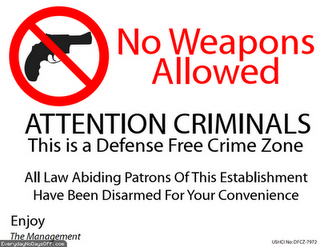 Gunsnfreedom.com published a photograph of the sign on May 21, making "The Pit" restaurant a self-declared gun free zone--the same kind of zone Michael Bloomberg and Moms Demand Action for Gun Sense in America pressure other restaurants into becoming. According to Durham's ABC 11, around 9 PM "three men wearing hoodies entered the restaurant through the back doors with pistols, and forced several staff members to lie on the floor." The armed men "also assaulted two employees during the crime." The suspects are still on the loose. When Chipotle announced their intended gun ban by saying the sight of law-abiding citizens carrying guns caused customers "anxiety and discomfort," Breitbart News responded with a simple question: If law-abiding citizens caused customers "anxiety and discomfort," what will those customers feel like when a criminal enters Chipotle, now confident that no victim in the restaurant is allowed to have a gun which which to fight back? This is only the latest of a spate of fast-food joint robberies ... in which the establishment "posted" the gun-free-zone signs on their door. John Lott has something to say about this sort of thing, here. On Wednesday, [May 1] gun control supporter and Fox News contributor Juan Williams appeared on the Lars Larson radio show and shared with listeners a personal incident that will hopefully have him questioning his long-held anti-gun positions. Williams told Larson, "My wife went to the gas station, and while she's trying to put the credit card in some guy rushes by her, gets in the car, and drives off with the damn car." Williams then noted that his wife's response to the situation was, "I wish I had a gun." The article goes on to cite Williams' earlier statements (2008) objecting to the Heller decision, and (2000) referring to the Constitution as "a living document". In his 2000 he specifically said: "I don't understand why we're piddling around. We should talk about getting rid of guns in this country." Mister Williams, you should talk to your wife about this "piddling around" thingie. Maybe you'll listen to her. You missed Mother's day, but Father's Day is coming up real soon. Perhaps she'll buy you a gun, and then borrow it for shopping trips. Then you'll both be happy. As far as Fox’s The Five co-host Bob Beckel is concerned, black Americans should not look up to Condoleezza Rice as a “symbol,” because she grew up in a “middle class family.” Obviously lost on Beckel was the fact that Condi’s parents achieved success in America. So she is to be discredited for that, Bob? Incidentally, Dr. Rice grew up in Birmingham, Alabama in the segregated South, graduated from college at age 19, became a provost of Stanford University, National Security Adviser, and Secretary of State. Bob, dude, your liberalism is showing – loud and clear. Bullying occurs at many levels. None of them .. either in a Chicago massage parlor or at a New Jersey university commencement ceremony ... are conducive to civilized dialogue. And we wonder why the children are so violent. P.J. O'Rourke says he knows why college campuses stifle free speech — such as Rutgers University, some of whose faculty and students got former Secretary of State Condoleezza Rice to back out of delivering a commencement speech. "If you're looking for the fundamental problem, it would be the old coots my age, victims of the '60s, the real loser element,'' O'Rourke told "The Steve Malzberg Show" on Newsmax TV. Rice, who was invited to speak to graduating seniors, pulled out after some faculty members and students accused her of allegedly misleading the nation on the Iraq war and condoning torture during her time in the Bush administration. In a move which surprises absolutely nobody, Condoleeza Rice declined to deliver the Commencement Address at Rutgers University, where she had previously been invited to speak. Her concern was apparently the violence offered by protesters (both students and faculty) when it was announced that she would be the featured speaker. It was expected that she would keep the reported $30,000 honorarium which accompanied the invitation. After reading the announcement, it's difficult why members of the New Jersey state college student body and faculty objected to inclusion in the commencement ceremonies. Except that, of course, she is black. We Have a Renowned Faculty The Rutgers faculty includes winners of the National Medals of Science and Technology, MacArthur “Genius” Fellowships, Guggenheim Fellowships, and Fulbright Scholarships. We Are Highly Diverse According to U.S. News & World Report, Rutgers University–Newark boasts the most diverse campus in the nation, reflecting the rich array of people who call New Jersey home. See below for the RUTGERS UNIVERSITY announcement that Rice would speak at the commencement: This information is quoted in full, as nobody expects the webpage to stay online much longer. I bought Col. Cooper's "Gargantuan Gun Gossip" ... first two volumes, anyway ... and paid a lot for them. Later, they were available online via a website which appeared to be British. Just lately, I discovered that "Traction Control" had correlated links to which purport to be ALL of the commentaries. I recommend that you bookmark this link. You'll be glad you did! Burglars and thieves hit last weekend's Orlando gun show at the Central Florida Fairgrounds, according to police. While gun buyers looked for bargains at the Southern Knife and Gun Show, burglars broke into vehicles parked at the West Colonial Drive fairgrounds and stole guns, ammunitions and other items worth about $10,000, a report stated. The burglars smashed car and truck windows worth about $1,000 to take recently bought handguns stored inside the vehicles. If this isn't blogged, and commented in Gun Control websites (and the national news, etc.) a lot in the next week, I'll be very surprised. LOTS of talk in the comments section, about the efficacy of car alarms. Which, as noted, are commonly ignored. I remember going to a movie ... "The Burbs", w/ Tom Hanks .. a decade or two back. When the movie was over, I found my 1987 Porsche with driver-side window glass all over the seat. I talked to the ticket taker about why nobody responded to my horn-beeping car alarm: "Oh .. " she said, "Car alarms go off all the time. We don't pay any attention to them any more. It's .. like .. so common." Things have changed since then, apparently. Comments (see above) suggest that now there are car alarms which call your phone to announce that your alarm has been activated. Sounds if this is an idea whose time has come. But back to the gun show: no, the parking lots are not commonly patrolled. The off-duty policemen who are hired to provide "security" generally (in my experience) restrict their attention to the entries. They're there to make sure nobody brings a loaded weapon into the gun show. Obviously, we don't trust folks NOT to do the "Negligent Discharge" thingie ... you know as well as I do that there is a lot of gun-handling at gun shows, and an ND is a serious no-no. On the other hand .. carry is permitted at most gun shows. And loaded magazines in magazine carriers are typically allowed, too. The idea isn't to compromise self-defense, but to prevent NDs. We're not afraid of guns; we just want to give the IDIOTS among us to practice safe gun-handling. Gun shows and gun shops remain among the safest venues, vis a vis shooting incidents. Which we can't say for Gun Free Zones. 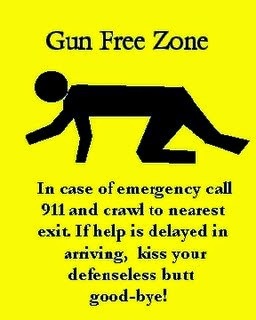 Monday evening’s Town Hall Seattle forum featuring top local and national spokesmen for gun control might better have been a discussion about world-class hypocrisy, since a sign on the door advised that guns were prohibited, and yet the anti-gunners were protected by armed security. Definition of "Hoi Polloi: : ordinary people : people who are not rich, famous, etc. Does this sound just a little ... arrogant ... to you? Welcome to Seattle: The Emerald City. Pay no attention to the man behind the curtain. I don't live in Seattle, but if I did and had I observed such condescension, I would have been insulted. It's bad enough when out-of-towners come to visit and require participants to follow their rules (Washington has had Concealed Carry laws for decades); it's worse when these visitors think that they are 'bravely' risking their lives to do so ... and hire armed guards to protect themselves from the very people they travelled to meet. Oh Brave New World, which has such people in it! I have no issue with those who fear Physical Harm; they're not necessarily afraid to stand up for their beliefs, they just don't want anybody to hurt them. Had they held an open meeting, with no restrictions on perfectly legal activities on the part of their attendees (eg: CHL holders who carry), we have to grant them the courage of their convictions. If they simply declared it a "Gun Free Zone" and posted signs to that effect, the attendees have a choice to obey their preference or not to attend ... which serves the ill purpose of having adequate representation of BOTH sides of the issue. But when they propose to discus "Gun Control", and then post an armed guard to protect themselves ... that's both Hypocrisy and Moral Cowardice. If you want to talk about Gun Control, and don't restrict access to people who legally care firearms, it demonstrates that you welcome opinions from both sides of the political issue. And when you don't? You're no longer inviting a public discussion, but only preaching to the choir. Well ... the choir, and a few people whom you cannot possibly sway to your point of view. You, sir, are an idiot, and never will convince your audience othereise. The lawsuit challenges the City's practice of treating common folding knives as prohibited "gravity knives," then arresting and prosecuting law-abiding knife owners and intimidating retailers into paying large cash "sanctions" to avoid prosecution. Under the City's vague and subjective approach, it is impossible to know whether any particular knife will be treated as legal or prohibited. 2014 Candidate Ratings Oregon Firearms Federation Political Action Committee candidate ratings for Oregon House and Senate races are attached. Please keep in mind that these ratings are almost exclusively for members of the major parties. “Minor” or “third” party candidates are typically chosen at their conventions. The process of rating candidates can be very complex and while we do our best to provide the best overview of a candidate, in some cases it simply cannot be done. It's sometimes complicated trying to keep track of the candidates. In the case of this Oregon, it's difficult to keep track of the elections! .... and also to David. Codrea at War On Guns for providing a timely link to the website.